Amy’s Attic Self Storage is proud to be a part of Central Texas communities where we have secure storage facilities including: Belton, Copperas Cove, Harker Heights, Killeen, Morgan’s Point Resort, Salado, and Temple. Below is a list of community events to enjoy over the next few months. 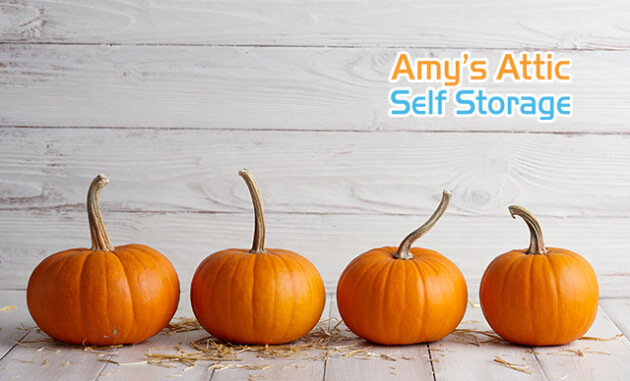 If you feel there is a worthy Fall celebration event missing from this list below, please contact us using the web form on https://www.amysatticss.com/contact-us/ to submit your Fall or Halloween event or activity. We look forward to hearing from you. Event Features: Pumpkin Patch, Hayrides, Corn Maze, Kidde Train, Games/Activities, etc. Event Features: An hour and a half (1.5 mile) lantern-lit tour down Salado’s historic Main Street accompanied by exciting ghost stories. Event Features: Craft Vendors, Food, Bounce Houses, Costume Contest, Raffles, Surprise Costumed Characters, etc. • Children under the age of 2 may ride in an adult’s lap without a ticket, but please indicate the child’s name in the box for passenger names when you check out. Event Features: Food Tent, Silent Auction, Hay Rides, Inflatables, Music & Games, Punkin’ Chunkin’, Story Time, Pumpkin Painting, Crafts & Activities, etc. Event Features: Food, Music, Hay Rides, Rock Wall, Trick-or-Treating, Bounce Houses, Horse Rides, Petting Zoo, etc. Event Features: Indoor Trick-or-Treating, Activity Booths, Candy, Concessions, etc.